Given the lack of any real fall leaves in the area of Texas where we are, we've decided that over the next couple of months we are going to make as many different kinds of our own as we can. M and G found this part of the project quite magical! Then I traced around some fall leaf shapes and cut them out. 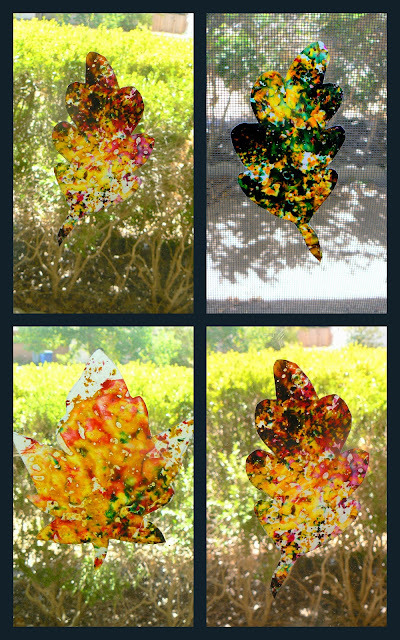 The girls applied glue stick to the backs of the leaves and placed them on the window panes. Turned our dining room into an autumnal cathedral. Great idea! We're in Houston, and don't really have many "fall" trees either! Do you have any advice for getting the glue off the windows? these look amazing! great idea! A Beautiful Book: Come on, Rain!